Chances are your first and only introduction to Red Hook was to furnish your apartment at IKEA. And while cheap home goods may be enough of a reason to bring you back to this South Brooklyn neighborhood (which is technically a peninsula between Buttermilk Channel, Gowanus Bay, and the Gowanus Canal) there’s so much more to do -- and more importantly, to eat -- making it perfect for a summer weekend. With salty ocean breezes, open green spaces, tourist-free streets, outdoor dining, and one main stretch (Van Brunt Street) home to the bulk of local businesses in the neighborhood, Red Hook feels more like a small town getaway than just another city neighborhood. To get to this semi-isolated neighborhood, you’ve got a few options: You can take the new NYC ferry ($2.75 each way) from Bay Ridge, Sunset Park, Atlantic Avenue, and Dumbo in South Brooklyn or Wall Street in Lower Manhattan; mooch off the free IKEA water taxi from Wall Street; hop on the B61 bus from various Brooklyn pick-up points (Windsor Terrace, Park Slope, and Downtown Brooklyn), or take a nice 20 minute stroll from the F/G stop at Carroll Street. From the plush banquettes to the tiny tables in the narrow dining room, this neighborhood staple (run by a local couple since opening in 2005) exudes comfort. The best start to any day exploring Red Hook, the brunch here covers all the classics, in addition to some with a Korean twist. 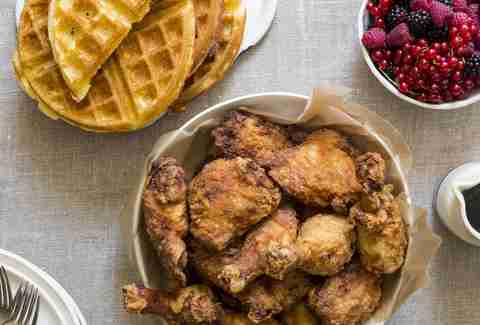 Think fried chicken and waffles with gochujang butter and a breakfast sandwich oozing with over-easy eggs. If you missed the brunch rush, you can still get Korean steak and eggs with kimchi rice ‘til closing. The neighborhood’s namesake seafood joint offers a slice of New England in its nautical-themed dining room. 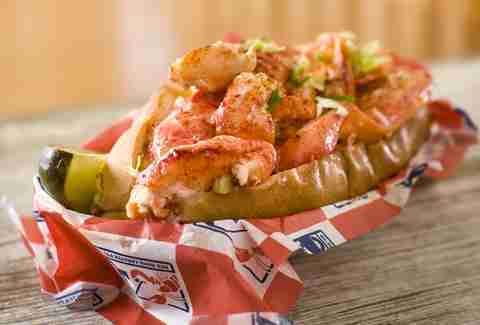 The mayo-phobic can take comfort in the Connecticut Lobster Roll, a mayonnaise-free sandwich that packs butter-drenched lobster into a warm roll, or the Tuscan Lobster Roll, with the same claw and tail meat tossed in a tomato-basil vinaigrette. To supplement the rolls, there’s lobster cheese fries and a creamy lobster mac & cheese. Visit on Wednesdays, when lobster dinners (which include a whole lobster, corn on the cob, potatoes, and slaw) clock in at just $25. Lines wrap around the corner for the slow-cooked barbecue by pitmaster Billy Durney, but the wait is well worth it. 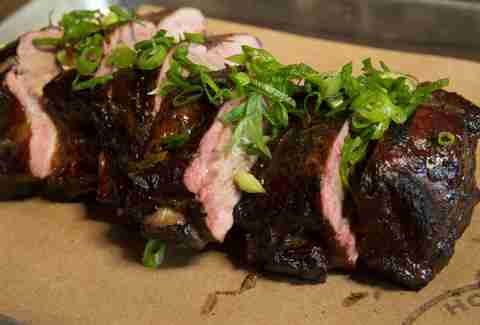 First-timers should start with a tray of meats sold by the half pound (brisket, pulled pork, lamb belly, or turkey) to be supplemented with your choice of ribs, ranging from Jamaican Jerk baby backs to cashew-sprinkled sticky ribs. If you’ve already had the basics, dive into the barbecue-based specialties, like meat-stuffed sandwiches and tacos. For sides, don’t skip the queso mac & cheese and the whiskey pickles (which help cut spice from more peppery meats). 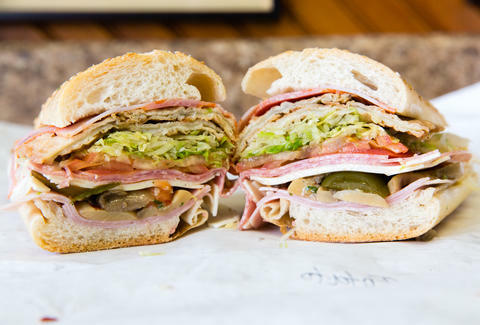 Slinging some of New York’s best sandwiches since 1922, this old-school Italian deli is indeed a destination. There’s a wide variety served here, ranging from an oversized house salad to a cold Italian Stallion prosciutto hero, but you’re here for the hot hero menu. Grab a chicken or eggplant Parm dripping in not-too-sweet slow-cooked marinara or go for the Sinatra Special, a grilled steak sandwich covered in sauce and melty mozzarella. 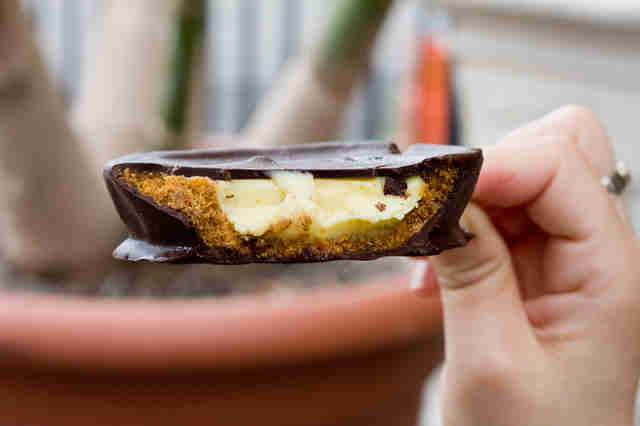 This cult-status sweet shop has reached destination level for out-of-towners, thanks to its legendary brownies and bundt cakes (and grocery store mixes and cookbooks). 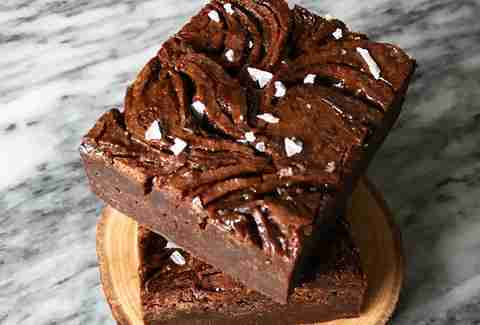 Yes, there’s a Tribeca location too, but nothing beats the original, where you can cuddle into a booth with flaky croissants, quick-to-sell-out cinnamon buns, and, of course, the beloved brownies and bars that combine just the right amount of salty and sweet. 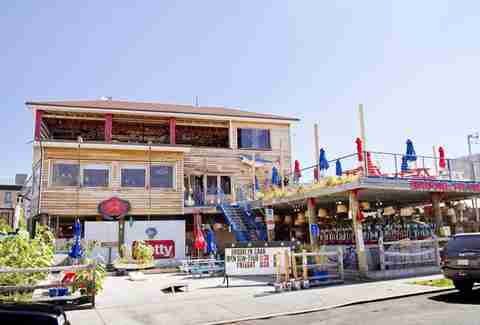 This wooden shack-like restaurant is a haven for seafood lovers on a summer day, hosting three levels of raw bar items, finger foods, and full-blown feasts. The best views (and coverage, should the weather be less than perfect) are at the top of the shack, where you can enjoy raw bar platters, lobster rolls, and eat-with-your-hands crab pots at communal tables. 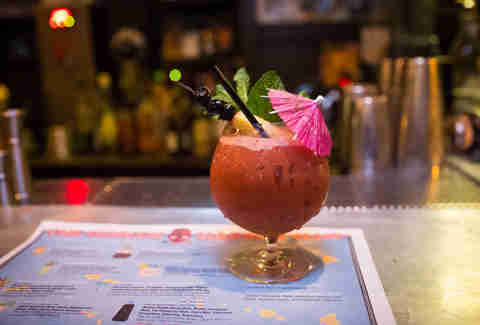 Supplement all that food with a shareable rum punch bowl, topped with a piña colada slushie and Swedish fish. On the ground floor, you’ll find Reed Park, the attached summertime adult-friendly playground offering mini-golf, shuffleboard, and other outdoor games. Food options are limited at this local winery (you can order some cheese and crackers), but if you’re at all thirsty, stop in for a tasting of locally made wines, all created from New York State grapes. A tasting of four wines (2-ounce pours of each, or slightly more if the somm is feeling generous) runs at $15 and if you’re in by 1pm on weekends, you can also get a complimentary tour of the facilities. Wines are also sold by the glass, if you’d rather slowly sip a rosé by the waterfront-facing window than scrutinize a variety of styles. The name of this bar/restaurant may not bring to mind tiny umbrella-topped, flaming cocktails, but come Thursdays when the Sunken Harbor Club pops up for the night, things get tropical with tiki-themed drinks and Polynesian fare to pair with your fruity frozen drinks. Even when it’s sans island flare, Fort Defiance is worth a stop, whether it’s for $14 oyster and drink Wednesdays, New Orleans-style brunch on weekends (think red beans with sausage on toast) or a simple, well-prepared dinner of fresh fish, burgers, and risotto. Before, after, or even in the middle of a trip to Sunny’s, dive bar enthusiasts flock to Brooklyn Ice House, known for its cheap bites (we’re talking an entire meal for under $12) that pair perfectly with PBR (especially a few cans in). Head to the backyard to chow down on chili and cheese-topped Fritos, pulled pork sliders, corn dogs, and other festival-style delights perhaps best enjoyed on a night when a bonfire roars outdoors. It’s like you’re camping, but can get picked up by Uber when you’re ready for the comfort of your own bed. This “globally influenced, locally sourced” tiny neighborhood gem is far from pretentious, offering comfort food culled from flavors and cuisines across the globe, often conflated into singular mash-up creations. Think elote fried rice with crema, grilled cuttlefish with yuzu and bacon, and home- (or haus-, if you will) made lemon pepper spaghetti with whatever looks good at the greenmarket, on the seasonally evolving menu. 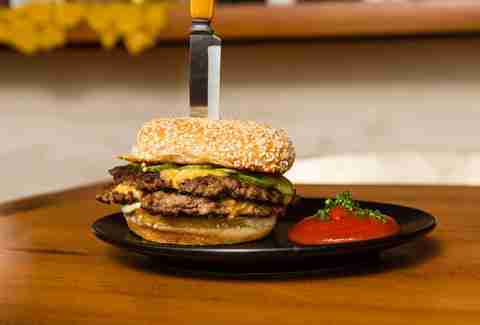 It’s also home to the best burger in Brooklyn, made with two well-griddled patties, cheese, house-made pickles, and special sauce on a sesame seed bun. You’re not here for the ambiance (the small shack barely has any dining space) but no trip to Red Hook is complete without seeking out this sweets shack to get the fresh-baked pies here. The menu is simple: Personal, 8-inch and 10-inch pies made with buttery graham cracker crusts and true Key limes (that is, from the Florida Keys), supplemented with frozen, chocolate-dipped mini-pies on sticks, all of which are satisfyingly tart with just a touch of sweetness. If you’re smart, you’ll stock up on some frozen sweets to savor from your freezer for the next few weeks. Brooklyn’s most beloved dive bar, Sunny’s is a piece of the old borough that’s weathered just about everything: Hurricane Sandy; the 2016 death of its beloved owner, Antonio “Sunny” Balzano; and most recently, a near shut-down when the bar scrambled to raise money to buy the building (the down-payment was just successfully raised, largely thanks to devoted locals). 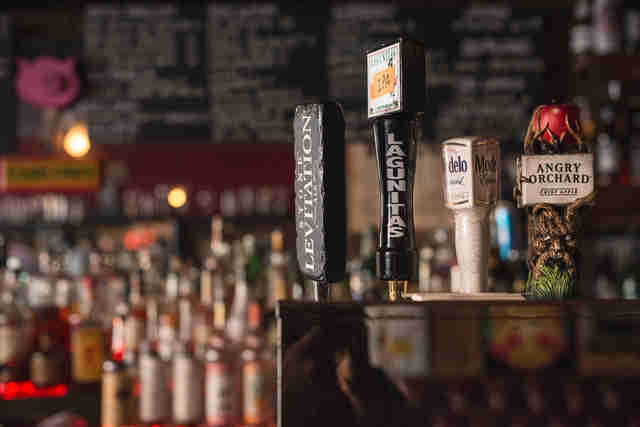 The supremely casual cash-only bar remains a neighborhood fixture -- and the perfect way to cap off any day in Red Hook -- thanks to its friendly staff, diverse clientele (everyone from local regulars to travelers from the other boroughs), cheap beers, and great live music. 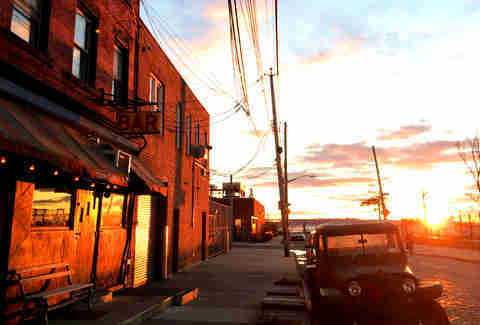 There are plenty of ways to entertain yourself in Red Hook after or in between meals: See a performance at Pioneer Works, hit the batting cages at Brooklyn Sluggers, sip whiskey at the Van Brunt Stillhouse, seep up history at the floating Waterfront Museum, or shop at the cluster of independent shops on Van Brunt Street. Melissa is a writer living in NYC. Follow her on Twitter and Instagram.